This sheet contains the PHA's location and climate. 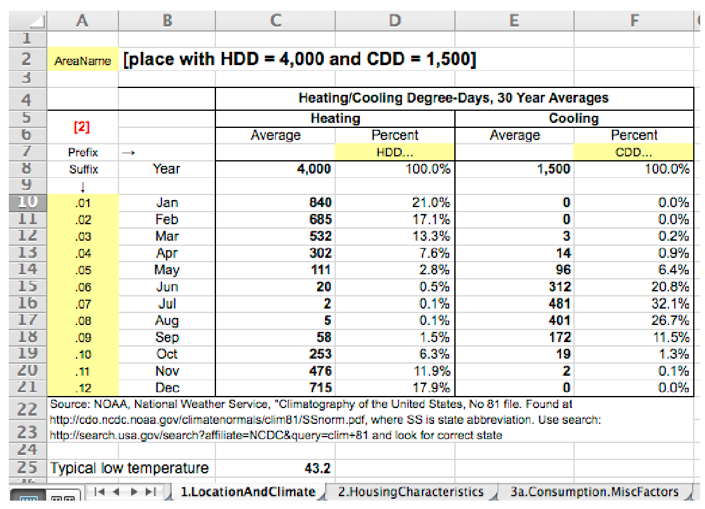 Climate data are 30-year average heating and cooling degree days (HDD/CDD) obtained from NOAA's National Weather Service. In most cases this is the nearest airport, but in large areas it might be the average of several airports or a downtown weather reporting station. Water heating—more expensive in colder climates. Heat Pumps—more efficient in warmer climates. These equation are all based on HUSM13/2015, and appear to be plausible across structure types and bedrooms. These include all forms of heating (gas being the most common) and air conditioning. Where air conditioning is used by most units in the area, an allowance for air conditioning is supposed to be included. As far as I know, HUD does not enforce this requirement. Each company’s billing structure is shown in detail, making it easier for non-specialists to update in future years—I do not force data entry into a fixed scheme as many utility companies’ rates are very complicated. In particular, taxes and surcharges often are applied differently to various parts of the company’s tariffs. The “named” parameters (with yellow background) summarize rates including all taxes and surcharges. Sources are shown for future updates. These rates are summarized into one fixed monthly charge (GFixed) and two charges per therm (GRate1 and GRate2), including all taxes. Repeated for all utilities that are commonly used in the area—electricity, propane and fuel oil, water, sewer, and trash. My calculations include whatever discounts might be categorically available to Section 8 clients. Heating and air conditioning costs are calculated for each month, based on heating and cooling requirements in each month, summed to annual totals, and divided by 12 to get average monthly amounts. A preliminary calculation (not shown here, but detailed in the full technical description, sheet 3c) computes “baseline” consumption for non-heating purposes. For example, for gas heating, gas consumed for cooking and water heating is calculated. Gas heating above the baseline is split according to rate band and priced accordingly. Other electric/lighting uses the lower price band (ERate1) and includes the monthly fixed charge (EFixed). Cooking & Water Heating both use the lower price band if applicable. Trash: in this case trash collection is included with property taxes, so there is no allowance for trash. This must be as determined for each area. 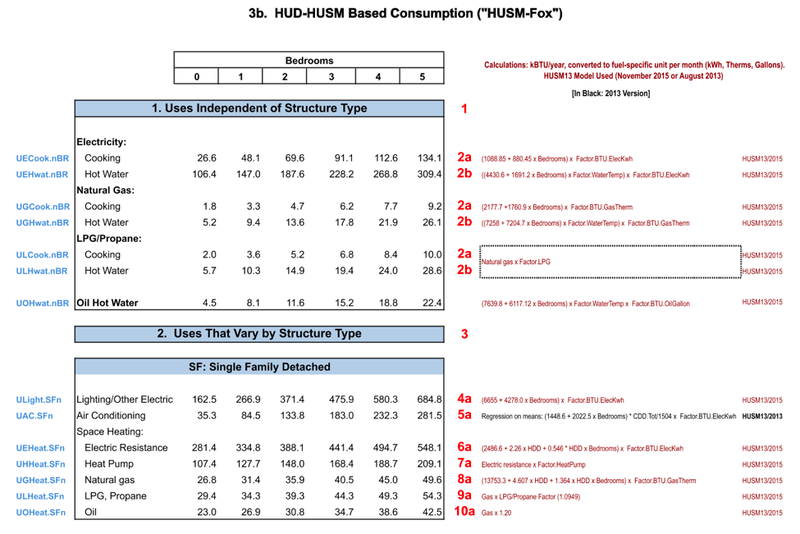 Consumption: my model is based on commonly accepted assumptions of 80 gallons per day per person for single family detached homes, and 60 GPD for apartments. The number of people is based on HUD occupancy standards. Multiple areas: Except for large metropolitan PHAs, it is very common for cities and towns to have their own water and sewer systems and rates. Frequently these rates are very different from the main city. My system can accommodate any number of rates. Cost: the monthly allowances are based on volume (hundreds of cubic feet/CCF in this case) and price per unit, including fixed fees and discounts. The fixed monthly charge for natural gas is entered in a separate line (rows 29 and 42). Electric fixed charges are included with Other Electric (Step 8).